In Teheran at the end of November 1943 the dry Crimean wine flows; it sets the prevailing mood. 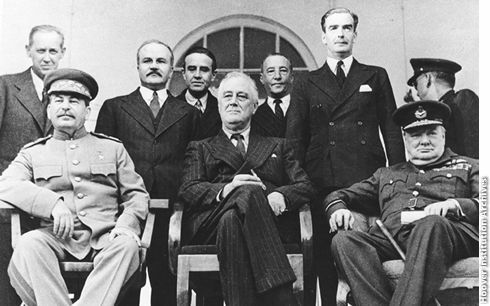 The “Big Three,” Stalin, Churchill, and Roosevelt, appear in the best of moods. In keeping with the Russian custom, the hours-long evening meal spans twenty courses, interrupted again and again with toasts. The war and its victims are so far away! On one front, extending from the Black Sea to the Arctic, millions of Russian soldiers at the same time freeze, starve, fight, and die. They drink to this with amusement; the English and American guests eagerly try to comport themselves in the most “Russian” manner possible. Roosevelt drinks without regard for his physician's warnings, aswim in relaxed feelings. Somewhere in North Africa, in Europe, and in Asia, American soldiers, whose destiny he never shared, fight, bleed, and fall. Winston Churchill also cannot resist the boisterous mood. He had arrived fairly sullen and could not suppress some biting comments about his Soviet “comrades.” Instead of Crimean wine Stalin orders for Churchill, in accord with his wish, champagne, vodka, and his beloved brandy. He drinks often and precipitately; the ruddiness in his massive visage intensifies from glass to glass as he listens smiling broadly to Stalin's indecent jokes. Somewhere English soldiers are fighting and dying on the Mediterranean, in Asia, in Europe, in the air-war over Germany. Somewhere English civilians tremble and die under the retaliatory strikes of the Luftwaffe. Churchill has waged war his entire life, but rarely exposed himself to the hardships of life on the front. All of that now is infinitely distant, and old and new cares are washed away with brandy.